Mephibosheth. What a sad name with an equally sad story to go along with it. How’d you like to have that for a handle? In Hebrew it means, “From the mouth of shame.” Not very complimentary. As if his name wasn’t sad enough, he had an accident when he was five: His nurse dropped him and he ended up lame in both feet! Talk about misfortune! Who was this character, why the strange name, and why is his story recorded for us? We’ll need to back up a few years to find the answers; back to when Jonathan, his father, first met David. Jonathan was the son of King Saul. At one point during his 40-year reign, they faced the Philistines and their giant champion, Goliath. 39 days into the confrontation, David came on the scene and, with God’s help, he knocked him out with a small, smooth stone from his sling. He then ran over, grabbed his sword and killed him with it and cut off his head! The Philistines, who were terrified and demoralized, turned and fled! It was a GREAT VICTORY for Israel that day! Well, that sure got the King’s attention. He asked his commander, Abner, who the young man was, but he didn’t know. So he went over and brought David to King Saul. Let’s follow the story. So here was David, this seventeen-year-old kid, standing in front of the King, holding Goliath’s giant, bloody head in his hand. And who was there at the King’s side? The crown prince of Israel: Jonathan. This was their first meeting. 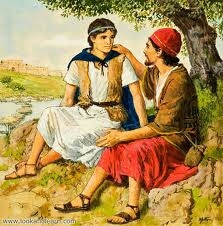 As David spoke to the King, the soul of Jonathan was “knit” to David’s and he loved him as his own soul. They immediately became such great friends that they decided to “cut a covenant” with each other. 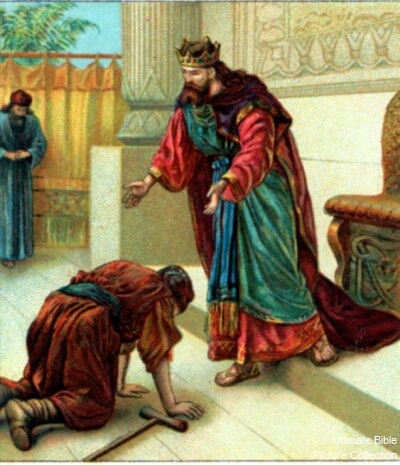 King Saul, also impressed by this young man on whom was great favor from God, took him that day and would not let him return to his own house anymore. In that culture, when two people “cut a covenant.” They didn’t “make a covenant.” It was for life, literally, until death ended it. They called it “Cutting, not making, a covenant,” because it always involved the shedding of blood. And if either party went back on their word, the penalty was death! The Greatest Covenant Of All. This is what happened at Christmas. God had to send His Son to “take on human flesh” so He could qualify to cut a covenant with the Father on our behalf.” He walked the walk of death in our stead, died the death we deserved and forever sealed the covenant. And you and I benefit! And what do we exchange with God? He gives us His robe of righteousness, we give Him our filth. He gives us His strength, we give Him our weaknesses. He gives us His health, we give Him our disease. And He fights for us! Doesn’t sound like an very equal deal, does it? You’re absolutely right: It isn’t. God is unfairly good on our behalf. But that’s ok…..I’LL TAKE IT! 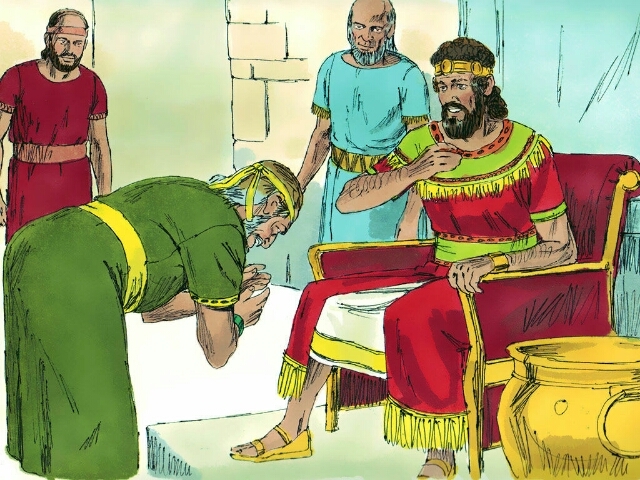 Jonathan, as the crown prince of Israel, took off his princely robe and placed it on David. David gave him his outer garment. He also handed him his armor, his sword, his bow and his belt. His robe was a symbol of his higher position. 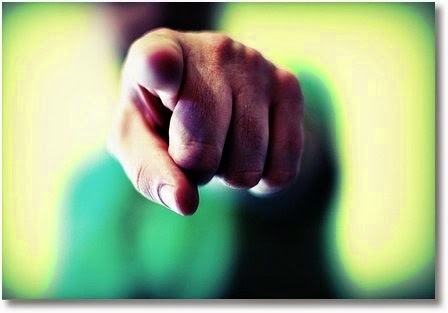 You see, it is always the higher, more prominent, more powerful that covers the weaker, lesser person of low position. At this point, David was a shepherd boy. This indicates an exchange of position. Jonathan also gave him four other items: Armor, sword, bow and belt. 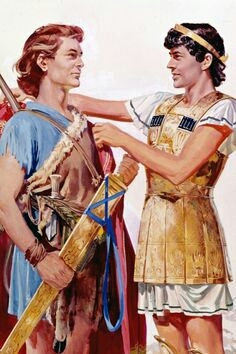 Being a warrior culture, he gave David his armor and weapons indicating that David’s enemies have now become Jonathan’s. Whoever tried to harm him in any way, Jonathan would come to the rescue. His belt is a symbol of his authority. All this was conferred on David. 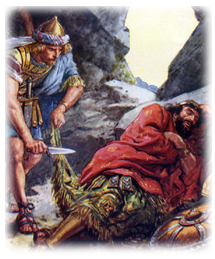 Who knew that the enemy he would need protection from was Jonathan’s own father, King Saul! Time after time he sought to kill David and who came to his rescue? Jonathan! Finally, they sealed the deal by mingling their blood. Each made a cut on their wrist, joined his to the other and spoke the terms of their agreement and walked the walk of death. Thus, they became blood brothers. The scar would remain as a reminder of their covenant. 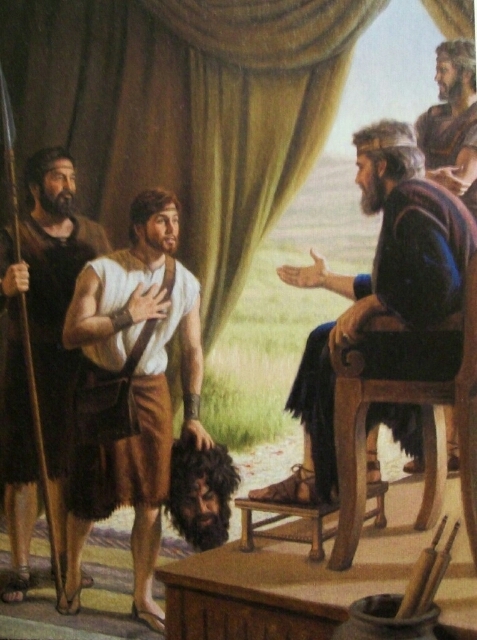 This is why, though he had many opportunities to kill him, David never laid a hand on Saul. He was, in effect, through Jonathan, in Covenant with his entire family. The day both Saul and Jonathan fell, that Covenant remained in effect. “Mephi” was the sole surviving member of King Saul’s family. Jonathan somewhere along the way, had a child of which, apparently, David was unaware. That’s quite surprising considering how close these two men were. When his Grandfather, King Saul, and his father, Jonathan, were both killed that fateful day on Mt. 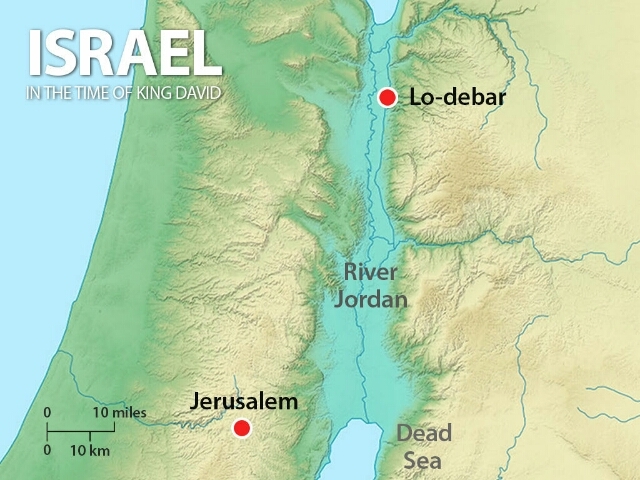 Gilboa, the palace inhabitants, upon hearing the news, were thrown into a panic. You see, they all knew that Saul hated David and had hunted him for years. They naturally assumed that David also had no love for the king either. Terrified that he was going to come and kill them, they fled for their lives. However, upon hearing the news of their deaths, Davis was so distraught that he cursed Mt. Gilboa. 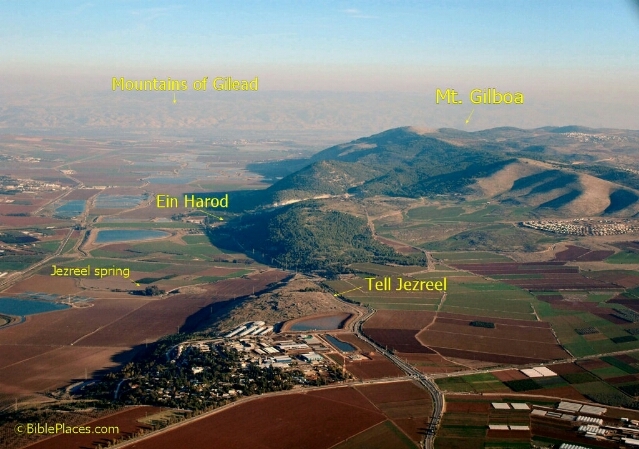 He said, “O mountains of Gilboa, Let there be no dew nor rain upon you…” He cursed that place because his dearest friend died there. To this day, the top of the mount is bare. Nothing will grow on it. 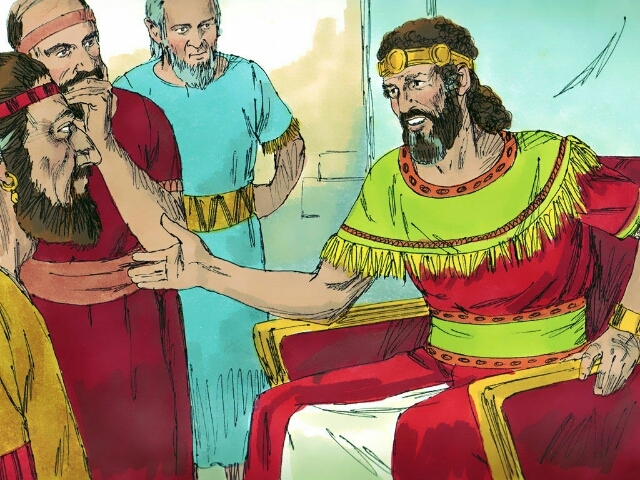 You see, everyone knew David was anointed by Samuel, the prophet. He was going to be the next king of Israel, not Saul’s son, Jonathan. That’s why he was so jealous of David. Undoubtedly he poisoned the minds of his entire household over the years against him to the point where they all hated and feared him. For years he relentlessly pursued David, seeking to kill him. Naturally they thought that when Saul and Jonathan were killed, he would come after them, seeking his revenge! Had they known about the covenant between Jonathan and David, they wouldn’t have been afraid. Far from thoughts of harming them, he sought for ways to bless his family. 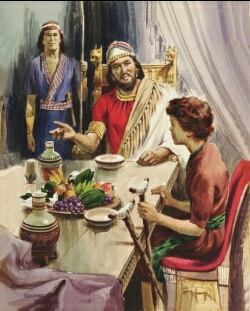 King David Seeks To Bless The House Of Saul. Mephibosheth probably heard nothing but awful things, too, about David as he was growing up, very likely from his nurse. “Don’t you let David know where you are or he’ll kill you. You know how your grandfather hates him.” When Saul and Jonathan fell that day, his terrified nurse no doubt picked him up and ran, trying to protect him. 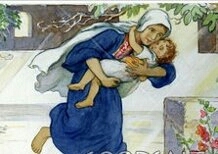 It isn’t clear exactly what happened but somehow she dropped the boy in her haste. His legs were crushed leaving him lame for the rest of his life. “Lo,” in Hebrew means, “No.” “Debar” means “pasture.” It comes from the root word, “Davar,” which means, “word.” It’s actually a play on words! This was a desert town where there was no pasture. In other words, “no word of God:” It was isolated, remote, desolate. How very sad! Here he was, a prince of Israel, of the royal house of King Saul, living in shame and poverty in a desert town, far from the palace, which was his rightful place. I’ll bet you that one day, after David had been King for a while, he probably looked down at the scar on his wrist and remembered the covenant he had made with his beloved Jonathan. So he voiced a desire to his staff to bless the house of Saul for his sake. Among his staff was a servant named “Ziba, formerly of the palace staff of King Saul. He not only knew of the existence of Jonathan’s son, he knew the town, the “address” and the family with whom he was staying! 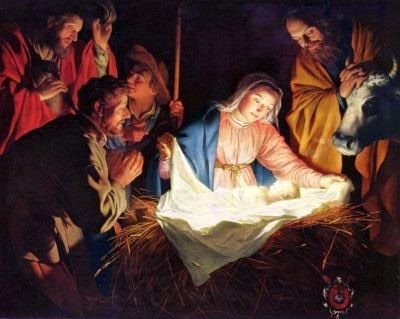 Elated, David sent his best men to go and fetch the boy, who was most likely was a teenager or a young man by this time. Having heard nothing but bad about David all his life, you can imagine his reaction when he heard that the Kings men had found him. Probably thought, “This is it. I’m a dead man!” Imagine his surprise being treated with honor and respect. Let’s follow the story. Wow! If he was puzzled before, now he was stunned! His story ends by reiterating that “he was lame in both feet.” Why? Feet in Bible typology depicts “walking.” This young man obviously was unable to walk well. David in this part of his story is a typology of our Heavenly Father. Like Mephiboshet, you and I are terrified of God before we come to Christ. We are far from Him in a dry, deserted, desert place where there is no word of God, only lies about Him. Just like him, we think that God, like he thought of David, is angry and out to get us. Unbeknownst to us, NOTHING COULD BE FURTHER FROM THE TRUTH. But just like in this story, the truth is, God loves us! He wants to shower us with GRACE!!! Like David and Jonathan, He cut a covenant with the human race. Saul, in this story, is a typology of Adam’s race. Though it was David, a type of the Father, and Jonathan, a type of Christ, who were the actual participants in the covenant, that same covenant was for the benefit of Saul and his entire family, a depiction of the human race. While we were yet sinners, Christ died for us. He was the guarantor of the covenant between His Father and us. There was a shedding of blood to seal the deal; the blood of the sinless Lamb of God! He has invited us to come and eat at His table forever, to pour out on us so many blessings, we will not have room to receive them all! It matters not that your walk, Church, is imperfect. At rest, seated at His table, eating from the bread of life, no one will be looking at your feet: They’re all under the table! And guess what? Everyone else sitting at His table is just as imperfect in their walk. They are lame in their feet. So fear not. Rest. Eat. Be refreshed. 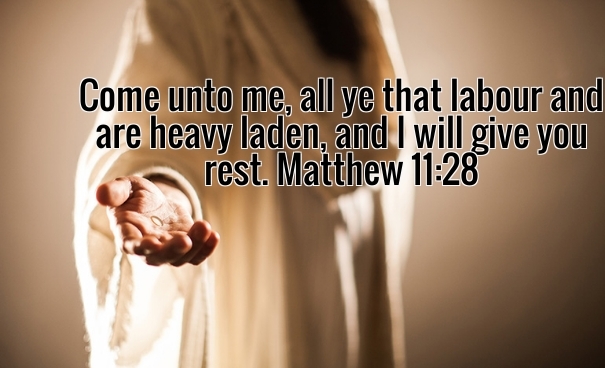 Take comfort in the story of Mephibosheth.